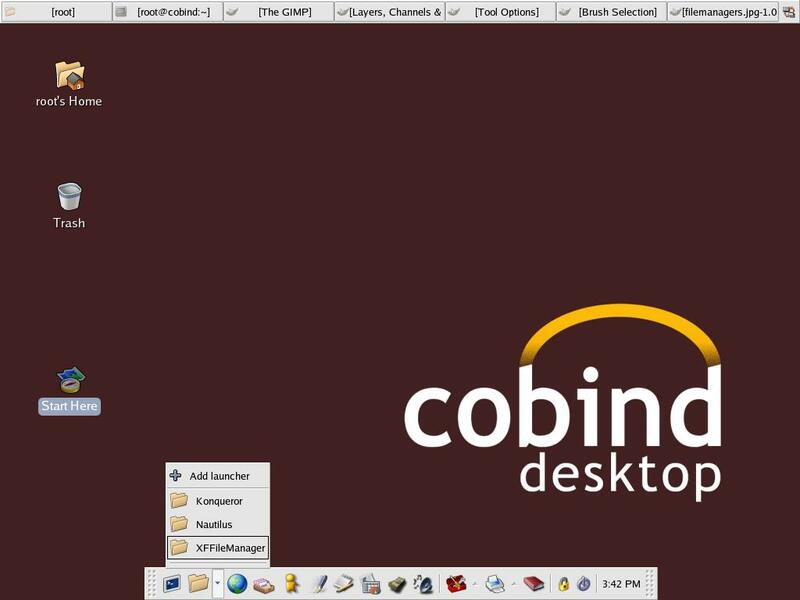 With all my ongoing talk on the Xfce desktop on FreeBSD in the last few weeks, I can't help but wonder: what happened to the Cobind Desktop? Cobind Desktop was a GNU/Linux distribution headed by David Watson that focused on almost zen like simplicity. 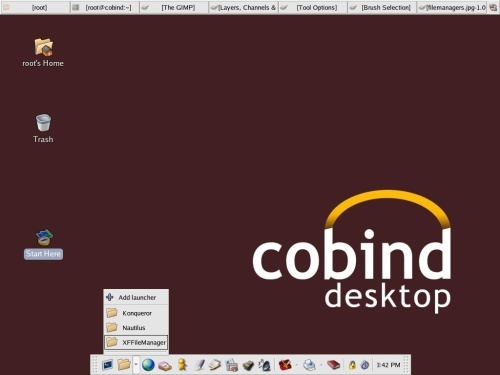 Unlike virtually every other desktop distribution at the time that focused on adding more and more features and applications with each release, Cobind was visibly designed from the ground up to be usable by only bundling a core suite of applications that suited the needs of the vast majority of computer users. As a consequence it was lightweight, fast, and could be distributed on only one CD compared to the 3-6 CDs of some of the larger distributions at the time. From the moment I lay eyes on the initial press release and screenshots for Cobind Desktop, I was in love. It was so elegantly designed and the 0.2 release ran beautifully even on my creaky 450MHz HP Brio BAx desktop I had at the time. It was obvious when using it that a huge amount of care, time and thought had been put into how it was put together and what was included, rather than just using a shotgun approach. 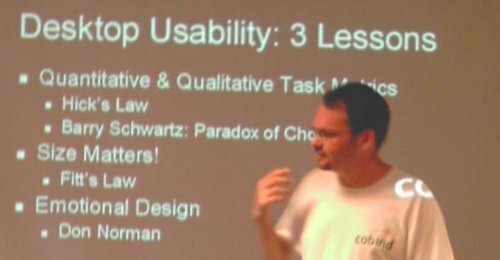 I never really realised it, but thinking back now it's clear the Cobind Desktop had a profound effect on my work as a programmer and system designer. I attributed my taste for elegant systems without unnecessary bells and whistles to using Apple software, but in fact Cobind taught me much about what I know when it comes to building systems. Here was a team of people who could have put literally thousands of polished, free and open source applications into a distribution but instead chose to select the cream of the crop and create a truly usable system. My Armada M300 FreeBSD notebook, circa 2008. You think Cobind influenced me in some way? USELESS ASIDE: That anime character is Sailor Mercury from the infamous Sailor Moon series, as I talked about in a seperate, entirely useless post. Elke and I used to watch it along with DragonBall Z on Agro’s Cartoon Connection before school when we were kids (those were the days!). Ami rocked because she was the "smart one" who used a little laptop to "assess" her enemies before fighting them. Not having blond hair I think also helped. Who needs brawn when you have brains right? And the computer that’s running on is a little laptop. I’m so poetic, in a very un-poetic way! Technically speaking, Cobind Desktop was based on the first release of Fedora after Red Hat split its primary release into enterprise and consumer desktop distributions. 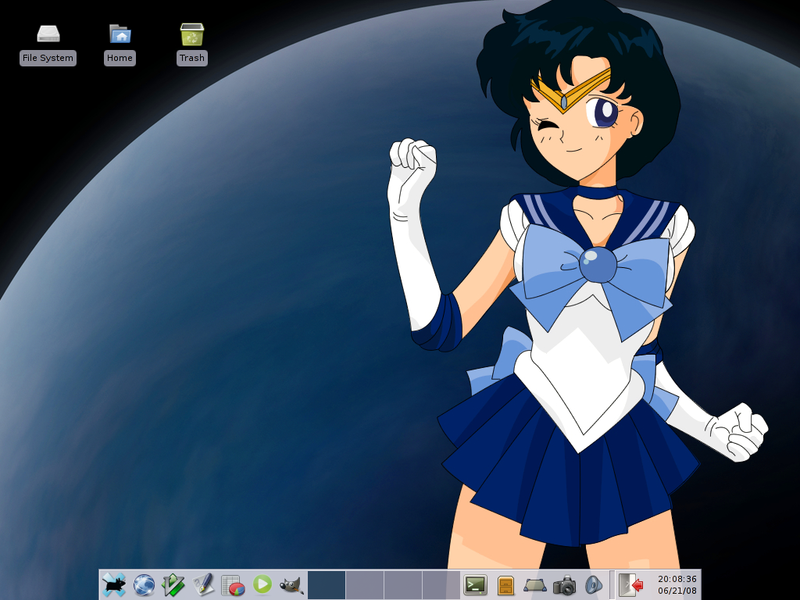 It used the Xfce desktop environment with the then-beta releases of Mozilla Firefox, Mozilla Thunderbird included as standard; I've been an avid user of all three ever since. The entire design concept is based on a book called the Paradox of Choice, by Barry Schwartz, who is a professor at Swarthmore. We believe that this concept can be applied to software design, and produce more usable products as a result. I’m not certain whether anyone has applied the concept in this way, but it flies in the face of typical desktop designs which are more oriented toward comparisons on a huge feature matrix. Our desktop product design is more like a desktop appliance. This kind of design is more commonly seen on the server, where programs are eliminated on the basis of security threats. We are doing this on the desktop, but we’re doing it because we believe that it produces a more usable product, not because it’s more secure, although that’s clearly a useful side benefit. Our desktop product is very focused toward doing a few tasks well, not trying to be all things to all people. That said, we do have a lot of advanced users who are trying the desktop, since they like the concept, and adding their favorite software with yum. But we are trying to reach a new audience with this product – crossing the chasm, if you will. 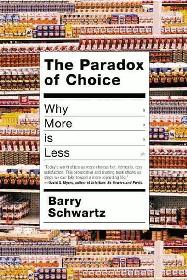 For what it's worth, Paradox of Choice is also brilliant! As far as I can tell, Cobind has not existed for a while now. Cobind.com now takes you to domain squatters, and DistroWatch reports their last release was version 0.2 which was made available two days shy of four years ago in 2004. Rest in peace Cobind, and thank you to all the developers for helping me out and sending me down the right design path. Newer post ← Power failures are.